¶ The first two chips listed below look like they came from the same set. The first three chips listed below are new-found designs, destined to be coded. ¶ For the Five-Ovals chip and the Double-O chip, I can show you a scan of a lower quality one for less money. ¶ Upon request, I am happy to show you the front and back of the very chips I have for sale to you. ¶ I got these together from a lady in Edgewater, Florida. She said, "My husband and I own a vintage jewelry shop. Recently we purchased a storage tub of vintage jewelry sight unseen, and found ivory poker chips lying in the bottom... ."
¶ I have very few of these, and the design is unique. I know of only 17 existing, several of which have cracks. Quite a number sold already. I have several left in good condition. One per customer. 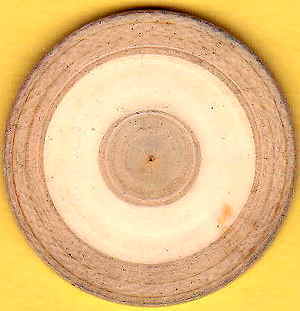 ¶ likely this chip is part of a set with the "5" below. ¶ good condition, paint may be missing in places along the edge. ¶ unique design. 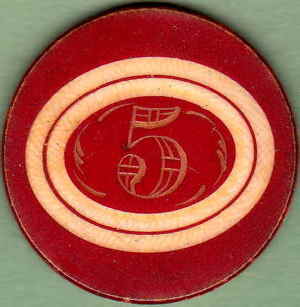 I know of only 3 (rare) ivory chips with the "5" in an oval, and I know of even less with those 3 little rectangles within the "5." 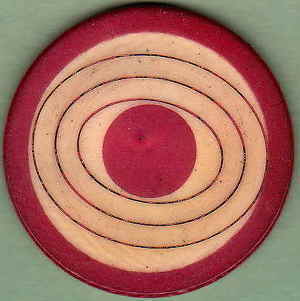 ¶ likely this chip is part of a set with the "Red-Ball-Oval" above. ¶ good condition other than some dirt stain on part of the chip. Good chip, and "Return Privileges" on everything. Ask for a scan of your chip, though unnecessary. 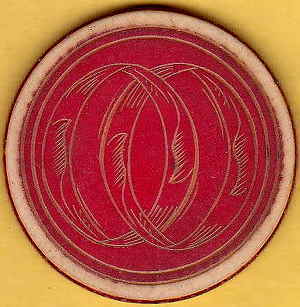 ¶ could be a Double-Zero or Double-Ring. I know of no ivories with just a letter(s) O, number(s) 0 or ring(s) on it. ¶ nothing chip, just showing it because it came with the above three chips. ¶ the ivory is intact, no cracks and OK, just the surface messed up.